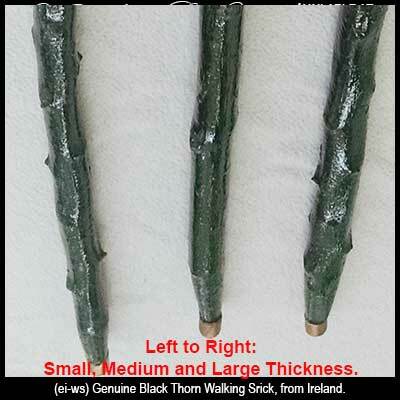 The Irish walking sticks from The Irish Gift House are made from genuine blackthorn wood. You will find varying degrees of evidence from the thorns on the shafts of these blackthorn canes. Think of glove size when selecting the thickness of your Irish walking stick. The shafts are proportional to the size of the knobs; the thicker the knob, the thicker the shaft. 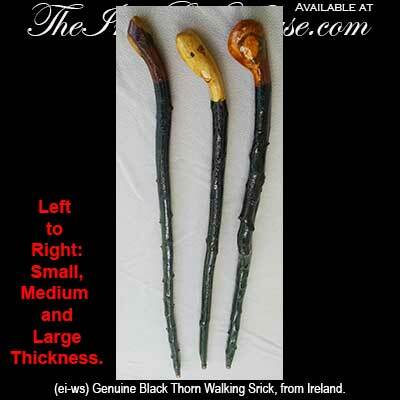 No two Irish walking sticks are identical as they are crafted from natural pieces of blackthorn wood in Ireland. All of our blackthorn canes are approximately 36" long and every one features an unique knob that shouldn't necessarily be classified as a typical cane handle. These Irish canes are made in Ireland by Grange Craft and they are complete with a copper banded tip. We have categorized the Irish walking canes by the thickness of the knob which complements the thickness of the shaft. A blackthorn walking stick is fashionable and functional but it may also be used for ornamental proposes.